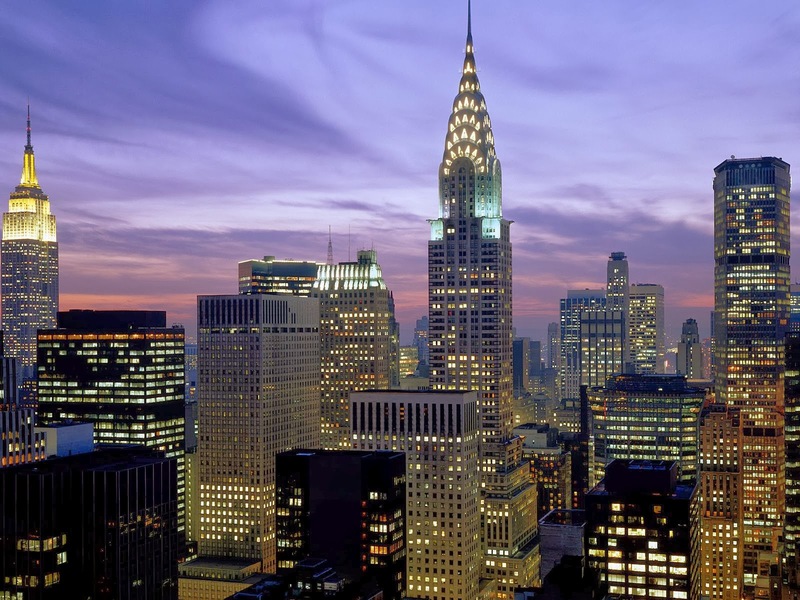 Robin and I will be off to New York tomorrow and Wednesday to meet the narrator and sit-in on the recording of Hollow World. I don't want to talk too much about it today because that is a big blog post and I don't have time to write it before setting off. I just wanted to let people know that I'll likely be behind on emails and the like and won't really be getting back into the swing again until late Thursday. when I mentioned my intention to dethrone George R.R. 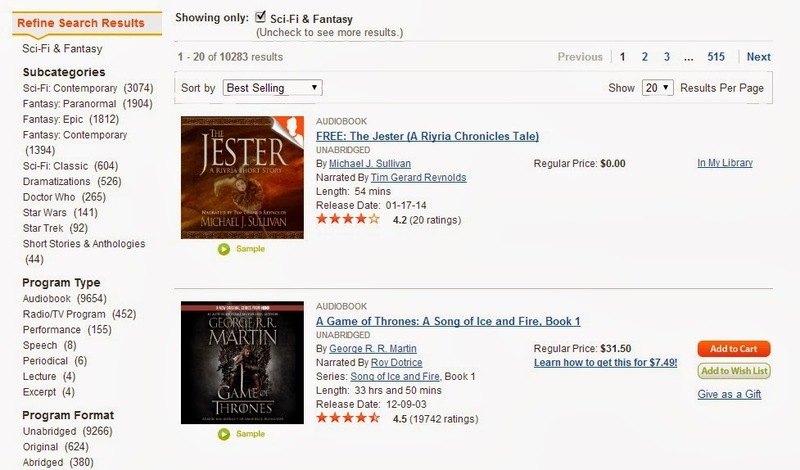 Martin from the #1 spot on Audible for bestselling Science Fiction and Fantasy. So, it was a great surprise when I looked this morning and found that it actually happened. Somebody, it would appear, has a sense of humor. What does it take to reach number one? Well I'm not entirely sure, but this is the sales information I have so far. 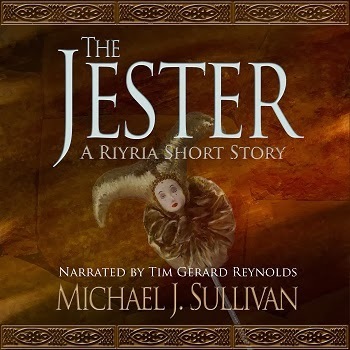 I'm so grateful to Audible for joining with me to make The Jester available for free and that the incomparable Tim Gerard Reynolds added his talent for yet another Royce and Hadrian adventure. 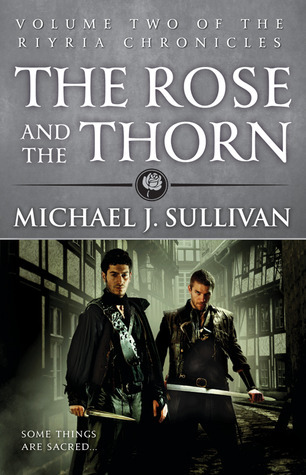 For those that like The Jester, and haven't yet listened to The Rose and the Thorn, you can join Tim and I with another free audio in the form of The Viscount and the Witch. It's not yet on Audible but you can hear it from my own site. Thanks to everyone for your show of support, and if you know someone who you've been telling about Riyria here are a few good free ways to get them to give it a try. Looking for more Riyria Adventures? Check this out. I've been getting a lot of emails recently about people going through Royce and Hadrian withdraws now that they have devoured both Revelations and Chronicles. If you are one of them, then I just might have the cure. The Jester, a Royce and Hadrian short story was released yesterday on Auible.com and the good news is it's FREE! Yep, it won't cost you a cent or a credit to listen to Tim Gerard Reynolds weave his magic as he performs this short story. 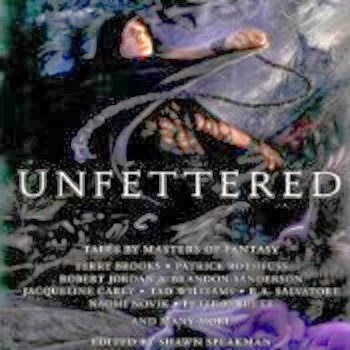 The full version of Unfettered is also available on Audible. While it's not for free, the authors who weren't previously compensated will get a portion of it's earnings so buying it is a way of saying thanks to the people who so generously gave of their time in creating the anthology in the first place. An ebook version of The Jester will be available soon. It was submitted to the various sites and I'm just waiting for them to go live. I'll update you when they are available. Hey everyone, Robin here, once more taking over his blog because he's asleep and this is a time sensitive post. We are both in Michigan (our old stomping grounds) to attend Legendary Confusion. Michael was out at "Barcon" with his "Horn Brothers" (don't ask but I'm sure you'll be seeing a bit about it on the Interwebs in the next few days. Anyway...he recently announced Blood of Thieves was available and so far it's doing really well. (Current #33 top seller on the site). I think part of that comes from it being one of their featured books. I think they did a nice job with it. 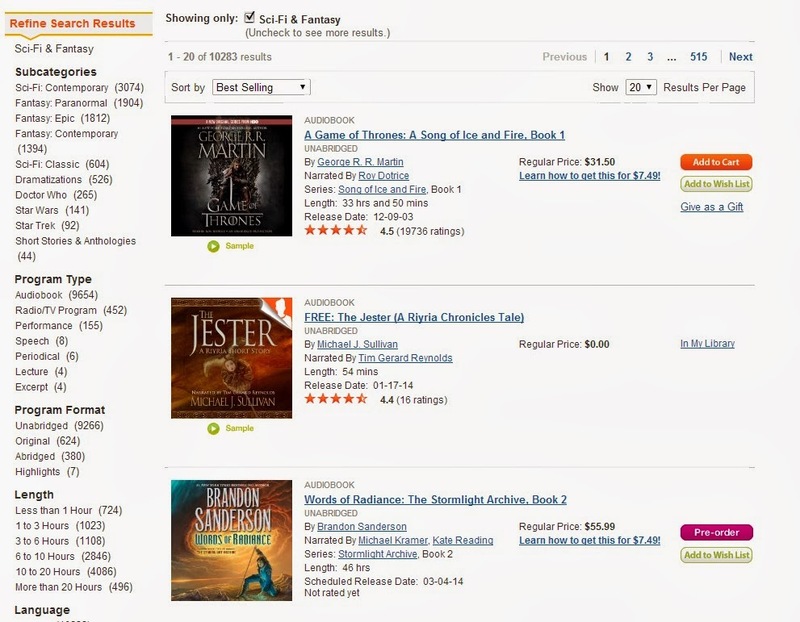 In any case, they have a $11.99 sale that ends tonight at midnight. That means you can get 2 great books for essentially $6 a piece in hardcover. 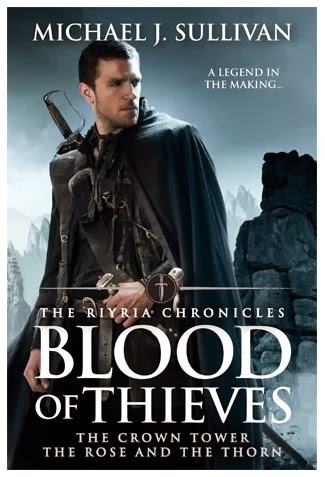 (Blood of Thieves contains two full-length novels: The Crown Tower and The Rose and the Thorn. 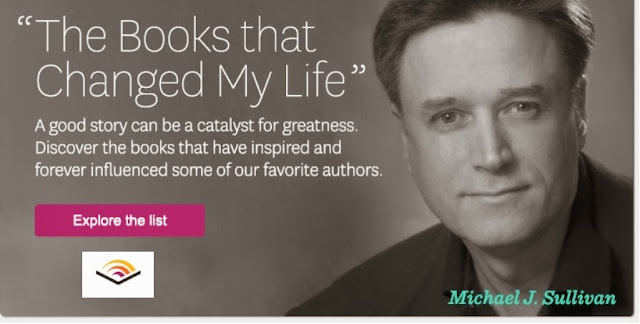 Michael and I will be heading back to Virginia soon, but out of contact for a bit, so if you are emailing him and haven't received a response, that is why. Don't get too excited. 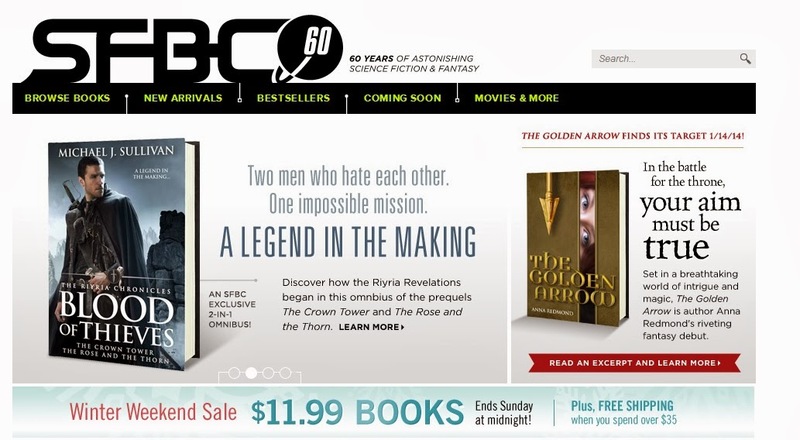 This isn't a new Royce and Hadrian book it is a new hardcover omnibus which contains the two books of the Riyria Chornicles: The Crown Tower and The Rose and the Thorn. It is only offered to members of the Science Fiction Book Club. But just as with the other hard covers, there will be people reselling them on Amazon's Marketplace so expect to see it popping up there soon. It's really quite the steal as you can get both books as a hardcover for $17.99 + shipping and the trade paperbacks are $16.00 each. I have ordered a few copies myself and will sell a few signed copies via my website once the arrive. I ordered these well before Christmas and my order still says "Processing" so I don't think they are actually shipping yet, but they should be soon and since sfbc.com is featuring it, I'm assuming they expect to be able to fulfill those orders soon. When I have my copies for resell available I'll post here. Well the holidays are over and it's time to get back to work. Well truth be told I was working all through the holidays, but I was dedicating myself as much as possible to writing my current work in progress (which is in the home stretch). But now that others are getting back to their jobs I thought I needed to take a minute out of my writing to make a blog post. So here I am. 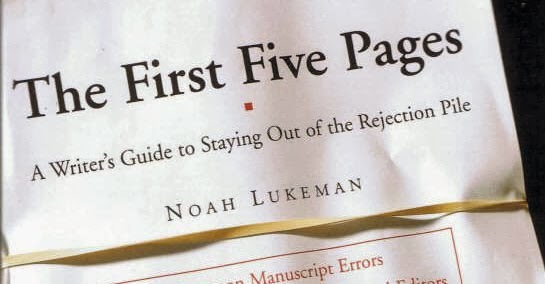 Whether you are submitting to an agent, publisher, or self-publishing, the first five pages of your work are essential. They can easily make or break any chance of a sale and I'm not the only one who feels this way. Famed agent Noah Lukeman felt so strongly about this that he wrote a book...called ...you guessed it, The First Five Pages. If you've not had anyone but yourself (or a loved one) look at your writing, it's almost impossible to know whether it is ready for prime time or still needs more work. 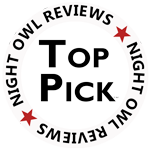 I'm really fortunate (in all kinds of ways) but also because I belong to a great writer's group, and I have fabulous beta readers to give me feedback. Others, may not be this fortunate. I also have some strong opinions...and a desire to help out other writers. So as part of my New Year's resolution I figured I would try to give back and one way I can do that is by offering some independent evaluation. I'll review/critique the first five pages for 1 - 10 authors a month. I'm not saying that my opinions mean much in the grand scheme of things, but I have at least had a few books published and have a generally good idea of what publishers are looking for. What you do with the feedback is your own business...use it, throw it away, burn it and me in effigy, but at least I'm impartial and sometimes that is hard to find. How do you get selected? The fickle finger of fate will decide. In other words, I'm going to use a random number generator. I'll likely not even read the body of the emails, so that won't effect the decision. Plus it saves you the time of writing something to compel me to pick yours, and me the time of reading and feeling bad because I didn't select the person who has six months to live and their bucket list includes getting feedback from me on something they wrote (not that I think anyone has such a thing on their bucket lists - but you get the point). How many will be selected is going to depend on how many come in, how long it takes me to review each one, and how much time I can devote to this. Microsoft Word document with 1" margins all around, double spaced, using 12 point Times New Roman font. Feel free to italic and bold as needed, but don't substitute underlines for such - I'd rather see the manuscript as it would appear in a book. You can send less than 5 pages but no more than 5 pages. Don't cut off a sentence midway. Also this must be your first pages. You can send me your prologue or chapter one, but please don't send me five pages from chapter 3 or your best five pages that are in the middle of your book. Don't "follow up" to see if I received it or to find out if you were picked. I'm going to try and keep the admin of this to be a minimum. If I look at it, I will respond. If I don't respond, I probably didn't see it. One entry per email address per month. Which means that you can send the same piece (or a different one) each month. But please wait till the start of the month. Don't send me 3 submissions in January and expect me to parse them out to the other months. Well that's all I can think of for right now. I might revise this as time goes on - but I think this is good enough to start the ball rolling. Oh yeah, one last thing. Don't submit if you don't have a thick skin. If your work is great as is, I'll say so, but it will be more helpful to you if I look at it with a critical eye. The intention of this exercise is to learn and grow, not to have your ego stroked...and I'm not very good at "being nice." But if what you are looking for is honest...then I'm your man.